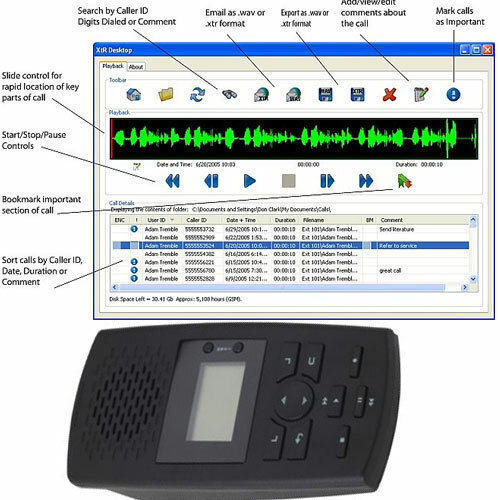 The SD Phone Recorder allows you to record your Single Line Phone calls, and play them back on the SD Phone Recorder, or through your PC or MAC computer's SD Card Reader. No software to download. Just an SD Phone Recorder (The SD card it comes with is a 2GB memory card giving you approximately 42 Hours of recording time), and this memory card is what stores your conversations. Using an optional 16GB SD Card, you can record up to 330 Hours of recording time. Connecting the SD Phone Recorder is simple. Simply plug it into your wall jack, connect to your single line phone (home phones are generally single line), and select your recording method. You can record manually each call, or automatically record all calls. You Decide! It also has the ability to record by connecting to the handset of your single line corded phone. Calls can be played back or moved to a PC that has an SD card reader for playback and long term storage. The recorder is Caller ID capable, able to show both incoming phone number (where available) and phone digits dialed, time of call, date of call, and duration of call. The recorder includes an AC power supply. In order to save recording space, the recorder has the ability to start and stop recording when the phone line is active (when you pick up a handset) as well as when it detects voice (aka voice activation). It has a search feature that helps you locate and playback conversations on a PC computer. Although it is designed for analog phone lines, it has the ability to connect to digital/IP telephone handset cords. Digital Audio Recorder unlike other digital audio recorders and voice recorders. A cellular recorder and cell phone recorder. Excellent voice quality. Longest recording time available. Question: What kind of computer does the SD Phone Recorder work on? Answer: Any computer (PC or Mac) that has an SD Card slot and can play audio files. Question: Can I use this to record on my multi-line phone, or hotel room phone? Question: Can this SD Phone Recorder work with my internet based phone? Answer: If your computer uses VOIP phones such as a Magic Jack, it will most likely work. Also, if your modem from a DSL or Cable company has an RJ-11 type Jack (which most do), the SD Phone Recorder will also be able to connect through that RJ11 Jack. This SD Phone Recorder is in stock.